With that simple question GG Renee of the blog All the Many Layers made my day. Actually she made my month. I met GG Renee last weekend at the 2013 Blogalicious conference in Atlanta, Ga. Blogalicious, a blogging and social media conference for women of color, is in its fifth year and is a conference I’ve wanted to attend for a few years now. This year I jumped at the chance to attend BlogaliciousFIVE, which I was able to afford thanks to the many freelance gigs I’ve picked up over the past several months. Blogging is the love of my writing life. That’s no secret. But juggling freelancing, teaching, and See Jane Write often means my personal blog is neglected. I convinced myself it didn’t matter, that no one really reads that blog anymore. But GG Renee proved me wrong. 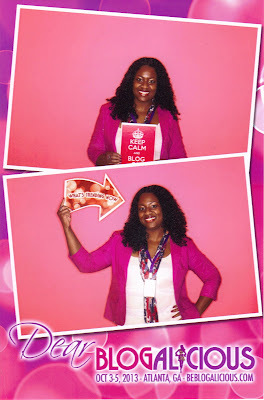 I went back to my hotel room and declared to my journal that I WANT TO BE BLOGALICIOUS! But what does that mean? After scanning through the copious notes I took at the conference, I think I know. Being Blogalicious is about being true. Be true to yourself, so many of the speakers told us. Blog about your passion. Don’t simply follow trends. Be true to your word. When you enter into a relationship with a brand, do what you’ve said you’re going to do. Respond to emails and meet deadlines. Be true to your readers. Sure, working with brands is great. We could all use the extra cash. But put good content first. Write for yourself and for your readers, not simply for brands. And no one likes a blog that’s full of nothing but sponsored posts. Being Blogalicious is about being a master. Marie Denee a.k.a. The Curvy Fashionista gave great tips on how to master your niche. Establish what you want to be known for, she said. Saying you want to be a fashion blogger is not enough. What kind of fashion blogger do you want to be? Once you’ve decided that, you then need to identify the leaders in your niche and follow them, but you also need to identify what makes you different. Be sure to stay on top of trends, news, and resources related to your niche. Become an expert. One way you can do this is by making better use of Twitter. Create Twitter lists based on your niche and spend your social media time reading through tweets from people and groups on those lists, not wading through your entire feed. Being an expert, however, is useless if no one knows who you are. So try some SEO plug-ins to help your blog get noticed. Denee also stressed the importance of branding. Your blog should have a distinct tone and try to use the same name on all your social media channels (i.e., I am WriteousBabe on Twitter, Instagram, Pinterest, and my Facebook fan page). Network with others and don’t be reluctant to lend a helping hand and share your knowledge with others. Being blogalicious means not being afraid of change. Over time your blog will evolve. 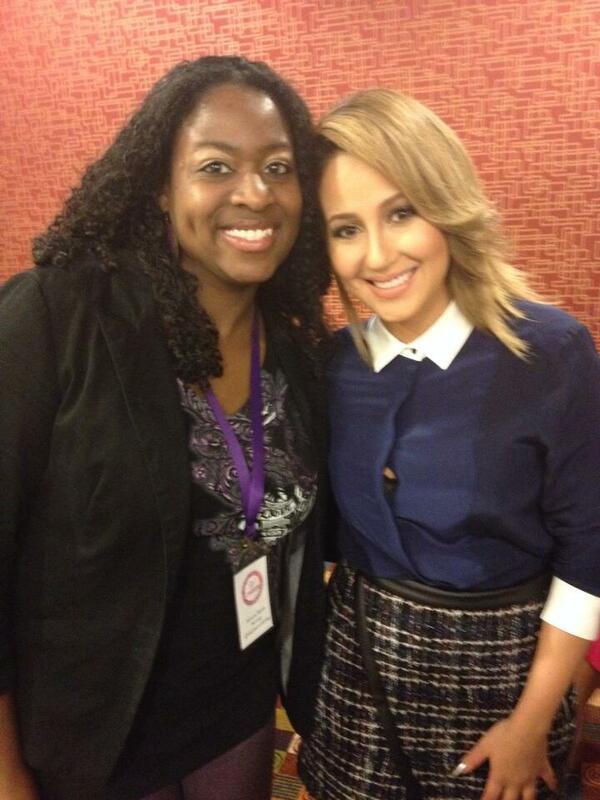 It will grow and change, Denee said, and that’s OK.
My snapshot with Adrienne Bailon! Being blogalicious is about having faith – having faith in your blog, in yourself and in something bigger than you whether that is a religion, a cause, or both. As a Christian I found it quite inspiring that many of the women who spoke at the conference weren’t ashamed to mention God. And I enjoyed the Saturday morning Q&A with Adrienne Bailon, who is best known for her work with 3LW, The Cheetah Girls, and The Real talk show. Bailon is the star of the movie I’m in Love with a Church Girl (in theaters on Friday). Quotes by her such as “God’s timing is perfect timing” and “You can be fly and love Jesus” had to be tweeted! Realize your value and demand the best at all times. Put into the universe what you want to get back. Do something meaningful every day. And of course, Barnett talked about her career as well. Barnett’s talk really made me miss journalism. I want to feel like a real journalist again. I want to see my byline in all my favorite magazines and on all my favorite websites, at least once. But I also want to grow this blog. Facebook. I want to start a newsletter and start doing regular video posts. I want to do more speaking engagements and actually get paid for them! And after Uneeka Jay's empowering talk on speaking engagements I have the confidence to believe I actually can make money from speaking at conferences and events. 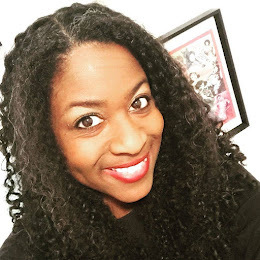 I think the best and most important thing that came from my Blogalicious experience was that I left Atlanta feeling more confident and I think that's a great way to define blogalicious too. Being blogalicious means being confident. I'm more confident in my writing, reporting, and speaking skills. 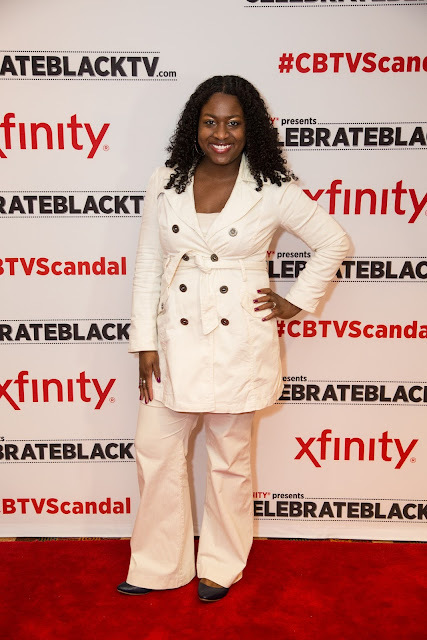 And after being a finalist in the Olivia Pope fashion contest held at the CBTV Scandal Season Premiere Party, I'm even more confident in my sense of style! I left Blogalicious overflowing with so many goals and dreams that I honestly can’t tell you what’s next. But I can say that I really hope you will come along for the ride. GREAT write up! I love this!!! You can do anything you set your mind to - you've already shown that time and again. I can't wait to see what's next! 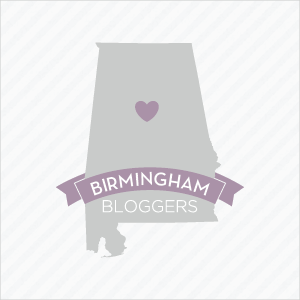 I am so ready to be Blogalicious! I've got ideas just banging into each other in my head! LOL It was great meeting you! Thanks, ladies, for reading and for your sweet comments! So awesome!!! Sounds like a great experience!! 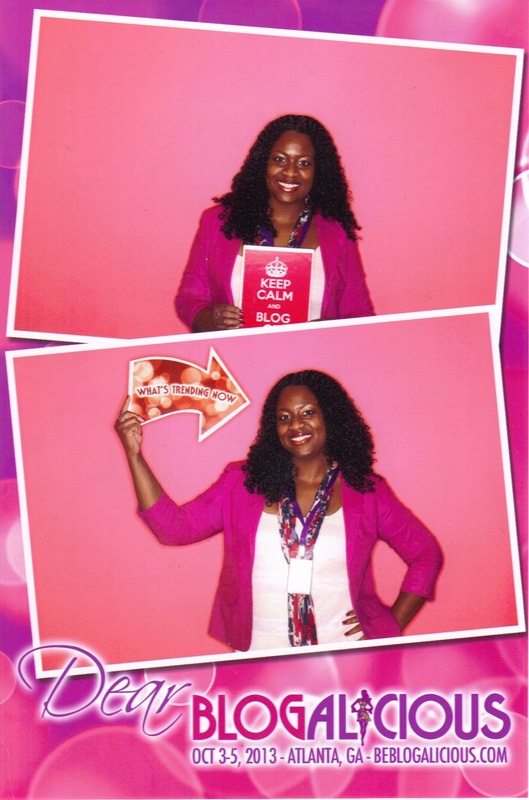 I want to be Blogalicious one day as well! I had been wanting hear more about the conference, so thanks for the report. You look fabulous too! Elaine W.